A painful love story of four childhood friends on a island. Mimi comes back from Tokyo to visit and meet her childhood friends. Seems like they are worried about Mimi for the sudden visit. Seems like she's heartbroken when her boyfriend broke up with her. To lift her spirits her friends try to find the legendary blue cat that has a bell attached to its tail. Legend says it will grant your wish, but will this cat even help what Mimi is going through...? The story is about a girl returning to her home island where she grew up on with her 4 friends. 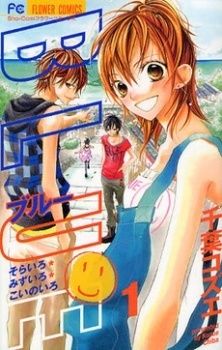 In Tokyo she had a experience with a guy and returned to the island after a breakdown where she begins to find happiness with her 4 old friends. The story so far is great, a few twists and turns, and heart wrenches. I do feel at times some things are rushed and leaves me a little confused. But that's the only problem I have, it can be frustrating at times but its overridden by the characters and the art. One really interesting thing I find about the main characters experience really interesting. You see the later effects of what could happen after the supposed happy ending we see in some Shoujo mangas. (im attempting to phrase this in a way that doesn't give anything away). I liked that back story, was very interesting. As well as some of the other back stories you get with the other 3 supporting characters. Its not all about the main girl.